Cheshire’s win over Ridgefield in the Class LL championship game, gives the SCC bragging rights as the state’s top baseball conference for 2018. As the Cheshire baseball team was raising its championship plaque, it marked not just a title for the Rams, but yet another season where the SCC staked its claim as the best baseball conference in the state. The SCC and FCIAC have gone back and forth in recent years, each having seasons where they felt superiority to the other and in 2018, the bragging rights belong to the SCC. The first round of the Class LL baseball playoffs was an annihilation for FCIAC teams. Of the 13 teams from the conference entering the tournament, nine were dispatched on the opening day of play. Two of those came at the hands of fellow FCIAC teams with Staples beating Westhill and Danbury knocking out Darien. Danbury would then be eliminated by Staples in the second round. The three-year run of the conference placing a team in the Class LL championship game looked to be in jeopardy as Staples and Ridgefield were the only two left heading into the quarterfinals where the Wreckers lost to eventual champion Cheshire 5-4. 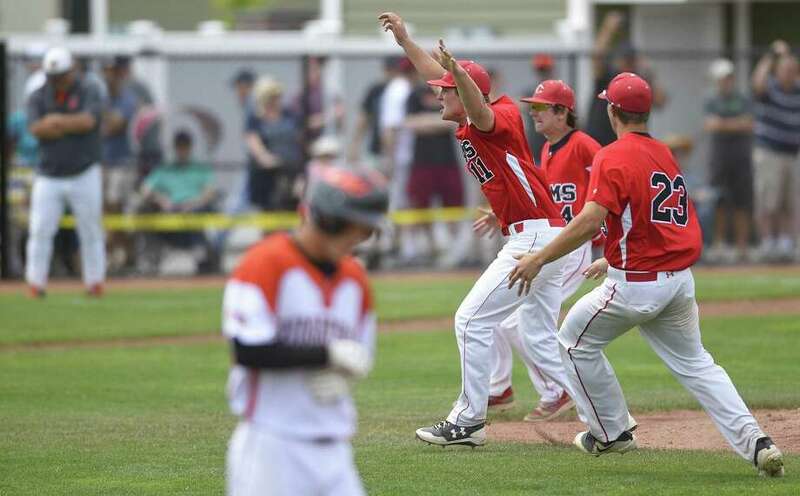 That left Ridgefield alone in the semifinals and the Tigers delivered, reaching the championship game with a thrilling 2-1 win over Amity in the semifinals. The Tigers did what they could to bring back-to-back titles to the FCIAC, but once again it was an SCC opponent, this time Cheshire, taking home the championship. That left the SCC again staking its claim to being the best baseball conference in the state and it is hard to argue against it. In the LL tournament, things went about as well as they could for the power conference. Placing three teams in the semifinals the conference was assured at least one seat at the table in the championship game. However, it was not Amity going to what would have been its sixth straight championship game and it was not No. 1 Fairfield Prep representing the conference, either. Instead it was No. 4 seed Cheshire running through the tournament and winning its first championship in 25 years, defeating Ridgefield 1-0 in the championship game. It is would be hard to argue that, once again, the FCIAC and the SCC were the premier baseball conferences in the state this season. The NVL, CCC and SWC have cases that can be made with teams winning at the lower classes this season, that they should be mentioned alongside the two big boys, but until they can break through in LL, the rest of the state cannot catch the FCIAC and the SCC. Not when the two conferences have made up the Class LL finals for the last four seasons. In Class L, an FCIAC or SCC team has been in the championship game for 12 straight seasons until the all-CCC final between Windsor and Wethersfield this time around. Guilford and Branford still gave the SCC two teams in the L semifinals while St. Joseph from the FCIAC lost in the Class M semifinals to eventual champion Seymour. Guilford and Branford along with the three LL semifinal teams gave the SCC five of the final eight in the two largest divisions. Seymour won the Class S title by beating another NVL team in Wolcott 13-2 in the championship game. Seymour capped a tournament where it outscored opponents 47-12, beating St. Joseph in the semifinals 8-0 before rolling to victory in the final. The NVL showed well this spring with those two finalists to go along with Class S semifinalist Holy Cross. Class S ended up being the spot where the SWC would claim its crown with Notre Dame-Fairfield giving the conference its first state title baseball since Pomperaug won Class LL in 2010. The Lancers were the only team from the SWC to reach a semifinal this season despite good seasons from Newtown, Immaculate and New Milford. This is the second season in a row that four different conferences won the four state championships. Regardless of the diversity in the four champions, it is clear the balance of power in state baseball still lies west of the Connecticut River and south of Interstate-84. It will stay that way until someone breaks the stranglehold of the FCIAC and SCC. Unfortunately, for the rest of the state, the teams from the two big conferences only seem to be getting better, not moving back toward the pack.